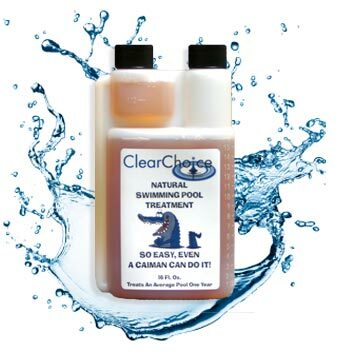 With Clear Choice Natural Swimming Pool Treatment, you cut out all of your opening and closing chemicals. If you are taking care of your water the way traditionalists say to, you should be using a metal sequestering agent, algaecide, and chlorine when you open your pool and when you close it. Depending on the size of your pool, this will cost between $70 and $120. During the season if you use chemicals only, it is recommended that you maintain a level of chlorine of 1.5-3ppm (parts per million). By adding our Clear Choice Treatment with its special blend of enzymes, bio-oxidizers and surfactants to your pool, you only need to maintain a level of .5ppm chlorine. About the same amount of chlorine in city tap water. This is a BIG SAVINGS. Aside from the cost savings, you will now be swimming in water that is as close to nature as we can get it in a swimming pool. Your pool walls, equipment, skin, eyes, hair, and bathing suit will all thank you for the decrease in chemicals. Vinyl and canvas liners or pool covers will last much longer. Pumps will not get the usual residue build up which shortens their life. Skin will feel soft, not dried out and tight, when you leave the water. You can swim with your eyes open under the water and it will not hurt. Your hair will stay soft, not dry and frizzy or turn green. Bathing suits will last longer. Our enzymes are safe for your family & pets, your wallet and the environment. You can backwash your filter or drain the water right onto the lawn or other vegetation without any harm. Swimming pool TREATMENT - 16 oz. Swimming pool TREATMENT - 32 oz. When you open your pool or start the Treatment for the first time you add 2 ounces per 10,000 gallons of water the first and second week. Then you skip week three and add 1 ounce per 10,000 gallons every other week during the season, (week 4, 6, 8, etc…). As you get ready to close your pool, you add 2 ounces per 10,000 gallons the last two weeks then close the pool. Always mix Treatment with 1 gallon of water and pour evenly around the pool perimeter. The only other thing you need to watch is the pH and alkalinity. You will need to bring them down periodically to the traditional range. Pick up what you need from your local pool store. In a normal year, 16 one ounce doses will need to be added. So for a 10,000 gallon pool you need 16 ounces a year, a 20,000 gallon pool would need 32 ounces.